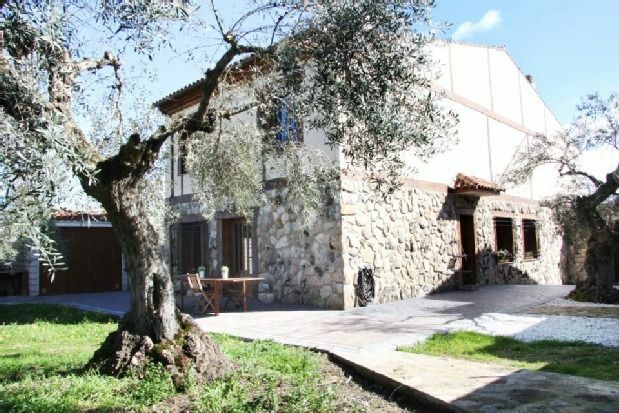 We wanted to build the Rural Houses, in an easily accessible area within the municipality; in an old olive grove that we have been able to preserve and recover five centenary olive trees. We have created an environment with the maximum comforts and quality equipment, without neglecting the rustic atmosphere, taking care of the decoration and details so that you can spend a few days of rest without missing any comfort. It is formed by two independent houses that are interconnected to be able to rent them as a single house or each house independently. Each house has a spacious living room with fireplace, full kitchen and guest toilet. The House "EL BERROCAL", located on the first floor, has 4 bedrooms, each with a full bathroom. "LA ENCINA" is adapted to users with disabilities or reduced mobility to an practicable degree. The farm has independent side accesses for each of the houses, which can be used as parking. It also has a covered porch and barbecue area in the garden. Both houses have: - Very large living room with fireplace, television and Radio / CD / DVD / USB equipment with iPod compatible base. - Kitchen-Dining room with all the comforts: Ceramic hob, Oven, Fridge, Microwave, Dishwasher, Coffee machine, Washing machine, Toaster, Blender and Complete kitchenware - Share garden area, Individual BBQ per house. - Individual laundry area in the garden. - Free crib SCHEDULES At your arrival a person will be waiting for you to give you the keys and show you the house and that you have all the tourist information and activities of the area. Normally the entrance is from 15:00 and the departure before 12:00 can be more flexible depending on the reservations. SERVICES It includes a full breakfast basket, coffee, tea, milk, juice, toast and muffins, oil and tomato. We have an extra service of homemade meals that we can leave in the fridge or take it away if you hire it in advance. In the house you have brochures and tourist information books, and on the web suggestions of activities but you can always ask us and we help you to organize your days in the rural house. Un fin de semana inolvidable. En la casa de abajo, la que tiene 3 dormitorios. Las fotos engañan, es una casa muy amplia, todas las habitaciones son mayores de lo que imaginábamos, y los baños, uno en cada habitación y otro más fuera. El silencio y la tranquilidad junto con unas camas extraordinarias no impidieron madrugar como queríamos. La casa está decorada de forma exquisita, llena de detalles, como las mantitas para arroparse en el salón frente a la chimenea. La chimenea de caset muy limpia, nada de olores ni humos. Todo en la casa es nuevo, y se nota. Situada estratégicamente, a 1/2 hora de Cáceres y de Trujillo. Ideal para conocer la comarca. La chica que te recibe es un encanto Paqui, nos atendió estupendamente, con botella de champán y bombones (por el día de los enamorados). Desayuno incluido, todo un lujo. Perfecta y completamente equipada. El jardín es precioso, con unos olivos centenario, un mobiliario de lujo, y su barbacoa. Repetiremos, porque nos queda mucho por visitar en la zona, y no pudimos probar la barbacoa. Sólo puedo tener buenas palabras para el fin de semana que pasamos en esta casa rural. Fuimos un grupo numeroso de amigos, tanto mayores como niños, por lo que ocupamos toda la casa, tanto la parte de arriba como la de abajo. No le falta detalle a las casas, habitaciones con baño con un diseño precioso, todo muy nuevo, no falta detalle de utensilios, incluso altavoces para smartphones. Fuimos cuando todavía apretaba el frío por lo que encendimos chimenea, pero durante el día pudimos disfrutar de una estupenda barbacoa. A poco tiempo de Madrid por lo que es ideal para desconectar un fin de semana y que los niños jueguen en el jardín sin peligro alguno. A la casa volveré, ya que la experiencia fue muy grata y nos sentimos fenomenal, no le falta detalle ni en la decoración. Muy buen gusto.